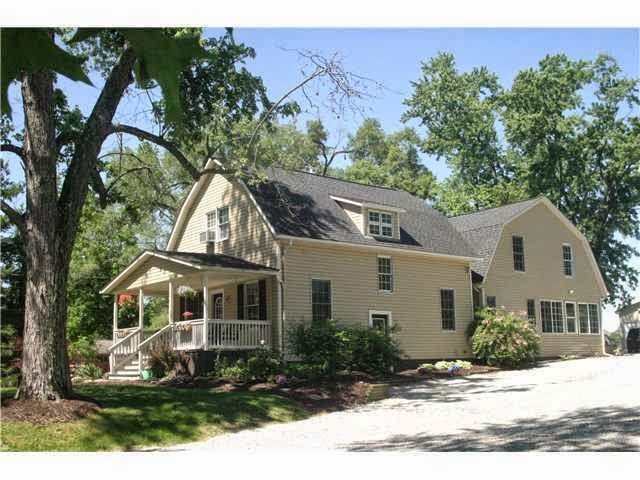 CHARMING, RENOVATED FARM HOUSE… on 2.31 beautiful acres! Great for entertaining! Close to all conveniences but it still feels cozy! Huge Kitchen with island & stainless appliances opens to Great Room. Large Master Bedroom with his & hers closets & sinks, large garden tub and shower. Any of the Bedrooms can be used as Den. In-Law Suite in lower level has full Kitchen & living area with separate door to outside. Gorgeous patios with stainless outdoor Kitchen. Above ground pool with deck. 1200 SF 2 car detached garage/out-building with 2 rooms for work or pleasure, heated & cooled, Kitchenette, Half Bath & 100 amp service. Building is currently zoned commercial. New roof ~2011. See list of ALL updates!!!!! So many! 8 BR’s & 5 Full Baths. Nearly 5,600 SF! Olentangy Schools. Only $499,000! Call DeLena today!